Yvonne Wells, 'Me, Masked II,' dated 1993, 60 x 61 in. I first encountered Yvonne Wells's quilts when I worked at the Kentuck Museum Association in Northport, AL. Yvonne is a longtime fixture on the cultural landscape of the region, and has exhibited at the Kentuck Festival for almost thirty years, winning a huge number of awards from the changing judges of the festival. For most of her adult life, Yvonne Wells taught physical education in public schools, although she also had a stint as a paramedic. It was not until 1979 while her home was undergoing extensive renovations that she turned to quilting. It was initially a purely utilitarian venture--the heat in her home was being restored, and she needed a practical way to keep warm, so her first quilt was made simply to warm her legs. 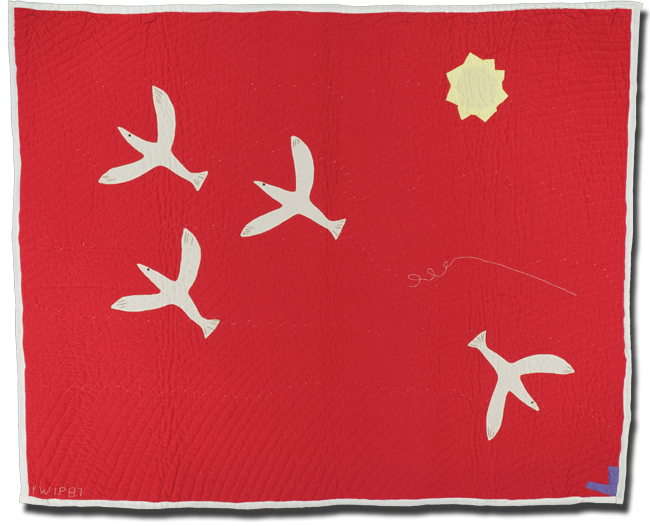 Yvonne used the knowledge she had from watching her mother make utilitarian quilts, the kind of quilts Yvonne describes as " the kind that were made in the morning and used that night" (I love that description). 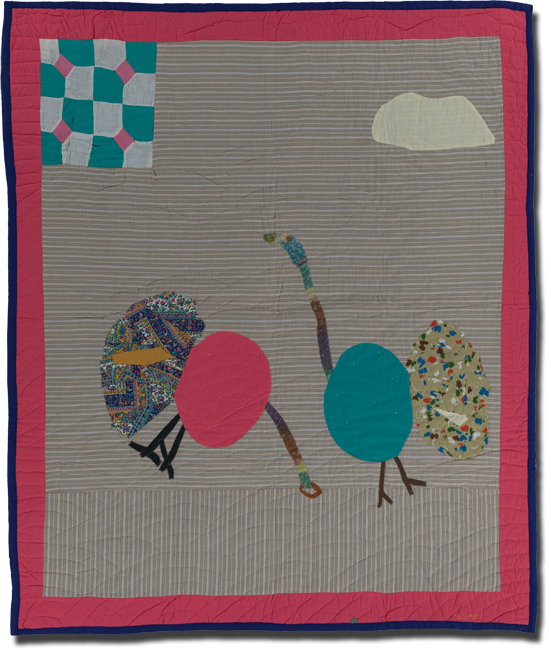 It was that first utilitarian, patchwork quilt that led Yvonne to realize the potential textile work had for narrative, spiritual and political expression. Wells states, "what my head sees, my heart feels, my hand creates.” Wells self-taught approach to her work, combined with her singular vision, results in some of the most compelling textile work I have ever encountered in person. Respect for Yvonne's work has grown far outside of just the West Alabama region, including an exhibition at the International Quilt Study Center and Museum at the University of Nebraska-Lincoln, and a line of Hallmark cards featuring her designs. The reason Yvonne's work resonates so strongly with me is the untapped access to her mind, unfettered by self-consciousness or outside influence. This really gets at the heart of the reason why I admire folk and outsider art in general, but Yvonne has little concern for traditional notions of perfection (which is a crippling, widespread issue with quilters) and what many think of as traditional quilting techniques. Her visceral work gives her ideas agency, and offers much to be admired and learned from. See below for more examples of Yvonne's incredible work.